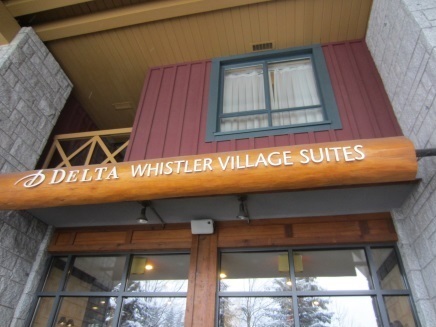 If you want to be in the heart of the buzzing village of Whistler then the Delta Whistler Village Suites, situated at the bottom of the village is worth considering. Its suites offer one/two bedrooms with a living area with a pull out sofa bed (not very comfortable), armchairs, TV, gas fire, a washing machine and dryer and a cupboard for ski gear storage. There is also a small kitchen area with seating for 6. The bedrooms are compact and come with an attached bathroom and a TV. Storage is adequate with a chest of drawers and a small wardrobe. The hotel provides robes and towels for use in the its free health club which has a gym, sauna, hot tubs and heated indoor and outdoor pools. Also based in the hotel is the Eco Chic spa for those much needed massages and beauty treatments after a day on the mountain, plus Summit Sports who will store your skis for free. The ski lifts are a ten minute walk through the Village; however a stress free way of getting to the slopes is to use the hotel’s free shuttle bus (which seats 11). The driver is especially helpful and has the all the information on the best runs of the day. For families who prefer peace and quiet, Legends at Creekside is a great alternative. Situated about a 5 minute drive from Whistler Village, it has a great location next to the Creekside gondola. 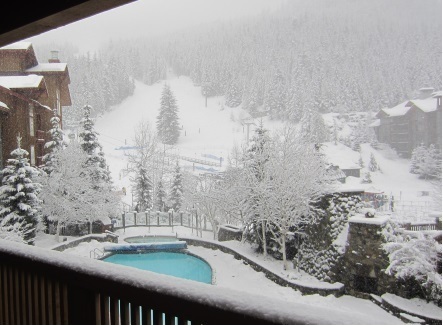 Beginner’s ski lessons are available, at Creekside, however for teenage ski school and adult lessons, you will have to go to Whistler Village either by using the gondola to ski down to the village or by bus (the stop is next to the hotel). Legends offer one, two and three bedroom suites which are more spacious and luxurious than the Delta Village Suites. Storage is more ample but there is only one TV in the living area. Like the Delta, there is a gas fire, cupboard for ski gear, a washing machine and tumble dryer and a small kitchen area. The pull out sofa bed in the living area sleeps two people and is extremely comfortable. Some of the rooms have wonderful views overlooking the 2010 Olympic Mens Downhill Ski run but these can be noisy at dawn when the slopes are groomed and also at night due its close proximity to Dustys restaurant (which is very good!). The hotel also has a heated outdoor pool, hot tubs, gym, children’s area, a film room and a BBQ for the use of guests, as well as individual lockers for your ski equipment. Next Post A day in MAX4 – ski lessons for adults, where less is definitely more!